This term, mystification, itself mystified, entered the field of psychotechnology to specifically account for indirect communicative manoevres in families and other micro-groups. Against the recuperating psychologism of such a reduction, the product of a boring familialisation of psychoanalytic discourse, we must define ‘mystification’ in a broader political sense – to sketch it out as a phenomenological politics. We must re-read the five pages of Marx on ‘The Power of Money in Bourgeois Society’ (in the Economic and Philosophical Manuscripts of 1844) where he analyses texts by Goethe and Shakespeare on the subject. This work done by Marx, expressing his hatred of money, is at the emotional heart of Marxism. It does not reduce such hatred to the understanding of money’s ‘origins’ – hate, on the contrary, should be used to understand and change the world. Therein lies one of the essential meanings of a possible anti-psychoanalysis. Money, says Marx, is “the alienated capacity of mankind.” So the divine power of money is that it brings together impossibilities. What my human powers are incapable of achieving I can realize by means of money. Money converts my powers into something they are not; it converts them into their opposites. For Marx this is all an illusion, an experiential distortion that occludes the condition of our being socially alienated. Utilising terms such as ‘displacement’, ‘exteriorisation’, ‘interiorisation’, in a totally depsychologised sense, I suggest that we examine the most basic structure of mystification: the power structure / power as an illusion (Later we will understand it according to the analysis of the concept of alienation.) We live in anonymous relation with others; these others who are ultimately ‘the state’. Certainly, leaders exist as concrete individuals; they give us the spectacle of obscene morsels [… ] But “they” are not “them”. 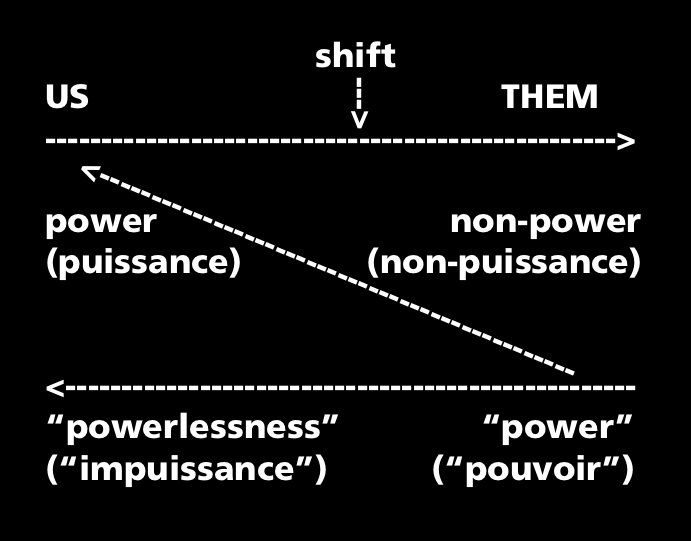 We live power (puissance), but it is experienced as something mysterious: our power is exteriorised in “them”, where our non-power (not powerlessness but nothing) is converted into power (pouvoir) by externalising itself. Displacement is one single act. Something doesn’t come, doesn’t pass. Nothing is passive: it is a praxis conditioned by a social alienation1 that is our historical condition. This alienation is susceptible to being transformed by another praxis , or an ensembles of praxes – other ways to insert ourselves into the world with the intention to destroy alienated social conditions. Demystification means nothing other than the choice that is this praxis. As to those in power, we can now see their desperate powerlessness: they do not have the power, they are bound by power. The mystificators are also mystified by mystifications that they wield upon the mystified masses that they mystify! No, there are no techniques of demystification. There is no human technology. Illusion (latin, in-ludere) means playing in a joyless game, playing the game of the system – the system, to the extent that we have created it, that cannot stand without us. Demystification means nothing – nothing but regaining our senses, senses it’s true to say, we have never lost. Translated and embellished by HS/Google from: Qui Sont Les Dissidents, Editions Galilee, 1978. Social alienation is only one chapter in the long history of alienation. I try to say more in The Language of Madness.